This one is for the boys!! Obviously you could put this on a girl too..but there is literally hundreds of cute and beautiful things for little girls..and not a whole lot of selection for the little men out there. I saw this on pinterest and thought I would give it whirl but as always in my own way! And I LOVE it..and more importantly my son loves it!! This in total cost me $9!! and I have oodles of felt and glue left over for future projects! - Trace out your heart, banner and letters. I sketched mine onto paper first. For the heart and banner I traced it directly onto the felt..The letters drove me insane!! It took a lot of patience to cut them out, but I was happy with the end result. -Glue your heart first..then banner..lastly letters and OH EM GEE...that is IT! How simple was that!!! Make one for the little man in your life..simply the cutest!! Seem's like everyone is buying stickygrams these days..and they are SO awesome! I am a huge instagram fan myself..and I just about bought some..but I always get the familiar thought.."Can I make it myself?" ...and so it turns out I can! and so can you! Easy , quick and super cute! - Your Favorite Instagrams! I just printed them as an 8x10 at Walmart. -Cut out your pictures, then put a think layer of Mod Podge over the top of the tile. Let sit for about 5 minutes. 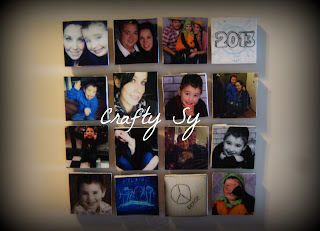 -Add Mod Podge to the top of your picture, be sure to get the sides as well to give it a good seal. I did 3 coats per tile and was happy with the effect. Let it dry until clear between coats. -Flip your tiles over and add your magnets. Let Set. Viola!! You got yourself some super crafty magnets! !